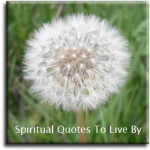 Abraham-Hicks quotes about death, dying and grief are often light-hearted as Abraham teach us that death is a joyous occasion. The majority of people view death as fearful and of great sadness, but through the teachings of Abraham, and others, more and more people are understanding that we are Eternal Beings and death is only: a transition, a letting go, a re-alignment with our true selves. Apart from being born, death is the only other experience of life that we all must face and go through. Death is not a bad thing, but a joyous thing. The beast, like all of you, chooses freedom first. And if ever the physical condition becomes less than joyful, the beast, if left to himself, will re-emerge into Non-Physical. The beginnings and endings that you call birth and death are more about helping you to focus than anything else. But they really are illusions. You are Eternal Beings. And when you re-emerge into Non-Physical, you do not become less-than. You don't become nebulous, unfocused energy that just swirls around in nothingness. You assume that perspective of All-Knowingness. You remember all that you are, not just the personality that you were. But as your daughter, or someone who loves you, recalls that which you were and approaches it from a positive vibrational standpoint, you can reconstitute that energy and be, for a moment in time, that focused energy. And it is very satisfying to someone who's made their transition into Non-Physical to take all of that power and clarity of Non-Physical and then have it re-summoned by someone who's focusing from a pure, positive place. The grief that you feel is usually about it feeling like an ending. At a level that you don't even consciously understand, you understand the Eternalness of your Being, and you love this feeling of wanting that continues to summon you forward. When someone makes their transition - what that always means, always, always, always means, no exceptions ever - what it always means is, this time/space/reality is no longer producing the stuff that summons them forward here. But, it does not mean that they are not continuing to be summoned forward. They are being summoned by the Broader Knowing. The re-emergence into Source Energy is always a delightful thing. There are those who feel such fulfillment of life and such Connection to Source Energy, who understand that there is no separation between what is physical and Non-Physical; who understand that there is not even a lapse in consciousness, that ‘death’ is a matter of closing one’s eyes in this dimension and literally opening one’s eyes in the other dimension. And that, truly, is how all death is, no matter how it looks, up to that point. This inevitable thing called death is not a bad thing. We know that you might think we're biased since we are considered dead! Usually the greatest discomfort that we feel physical beings feeling around the subject of death is a feeling of - I should have done something more, I should have said more, I should have completed something. And we say... Nothing is ever finished. There is no finish line.... There is no ending place in this Eternal life that we are all about. We think it's a really interesting thing how you all fall apart at the idea of death, when all of you are going to die. We think that when someone dies, it would be very good right now to begin practicing what you now know about death: it's this inevitable new step into a new perspective. It is the continuation of who you are from a more powerful vantage point. It is an awareness of All-That-Is from broader view. It is energy that now still has a clear view of all that is you. We’re not wanting to be insensitive to what so many of you are feeling, but we are very much wanting you to put this death thing in the proper perspective: You are all going to die! Except there is no death. You’re all going to make your transition into Non-Physical. It is time to stop making your transition into Non-Physical sound like a subject that is uncomfortable and begin acknowledging that it is something that happens to everyone. This death thing is so misunderstood. When you croak, no matter how resistant you've been to Who You Are - we like that word too: croak, it's so disrespectful, and since there is no death, we like to be as disrespectful of that ridiculous idea as we can - So, when you croak, you re-emerge immediately back into the awareness of Who You Really Are, and you leave behind any resistant patterns that you've picked up along this physical trail. So croaking is the true epitome of blending. You come back together with Who You Are. When you show yourself that you can return to joy under those conditions [grieving] there is never ever, ever, ever again anything for you to fear. You are Eternal Beings, in other words, you walk into this room, you all come willingly and yet you have not committed your life to being in this room. In a few hours, you're going to get up and you're going to walk out of here and everybody's going to say that's just fine. And yet when somebody makes their transitions, which is no different than that - they just withdraw their attention from one room and give their attention to another room - you all act like it's the end of the world. You are Source Energy that had something in mind when you made the decision to come forth into this physical body. None of you said, "I will go forth and stay in this body for hundreds of years." Very often your intention was to come forth, make a big splash, have a lot of fun, and then make another decision. Physical beings have turned this amount of life into an issue. You cannot evaluate quality of life by the quantity of life. You cannot judge the value of a life by its quantity. It is by the joy that you are feeling. The more joyful you are, the longer you live. Let yourself relax and breathe and be free and be joyous, and romp. The optimum physical life experience is to have plenty of things that stimulate you to desire, and an awareness of the way you feel, so you're reaching for thoughts that feel good - so you're wide open, so you're tuned in, tapped in, and turned on. 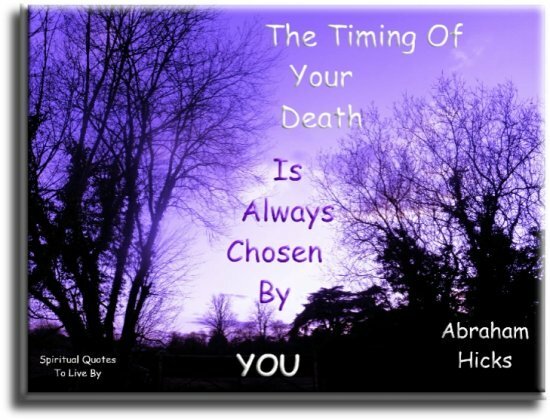 We promise you, the timing of your death is always chosen by you.